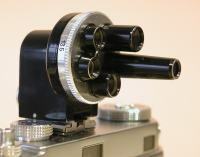 The Foca Universel is a French copy of the Leica rangefinders of the fifties. At a time when the first 35mm single lens reflex were beginning to appear, rangefinder cameras with interchangeable lenses ruled the world of amateur and professional photography. The most renowned were the Leicas, with their perfect quality and lenses. But France had something to say with the appreciated Foca Universel R which continued a series begun in 1945 with the Foca PF. First made in 1955 by OPL (Optique de précision de Levallois) Foca, the Universel R keeps and improves the characteristics of previous models. The curtain focal plane shutter gives speeds from 1/1000 s to 1 s. Short speeds are given by a dial on the top of the camera and long speeds by another on the front. Flash sync speed is at 1/40 s with two synchro-cord plugs : one for X and one for M sync. A film advance lever takes the place of the knob of earlier models. 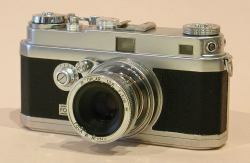 The rangefinder is improved and a self-timer is added. However, the built-in viewfinder is very poor. It has the standard 50mm field of view and includes the rangefinder but is unaccurate, dim and can't be used with glasses. A good expedient is the universal viewfinder which is required to use this camera efficiently (see picture on the left). It goes on the flash shoe and gives the fields of view of the 28, 35, 50, 90 and 135mm lenses by rotating the front part of the turret. Bright and accurate, it had the reputation of being the best of its kind. The Foca Universel has a congenital illness : when they get old the shutter's curtains slowly fall into dust. It must be used with extreme care as soon as the first symptoms (cracks and waves) appear and must be kept in a dry place. Shutter replacement is difficult and expensive. The sound goes "crrrk shlak clak". The crrrk is the sound of the film advance lever, the shlak the sound of the lever swinging back to its normal position and the clak is the sound of the shutter at 1/40 s.